Greetings to all of you on International Literacy Day! (see note at the bottom of this mail). There will be no lesson on Monday due to the annual Zoo Trip taking place. Tuesday's lesson with continue as usual. We will meet at the Zoo at 9:15am in time to meet the busses which will arrive before 9:30am. Volunteers are asked to pay your own entrance fee on the day as well as bring your own packed lunch with snacks/drinks for yourself. Please invite your friends to assist on the day or if you have children who have the day off from school and are old enough to chaperone a group of Grade 3s, we would be most grateful for any additional help that we can get. at 9:30am. We will meet at the entrance. Click here for directions to the zoo and a map. 1. We have told the kids that they cannot bring their own money or buy any sweets, food or go on rides. As tempting as it can be, please do not buy any food or pay for any rides for the kids that you are assigned to. We won't be able to do this for every child, and we want everyone to have an equal experience. 2. Please bring hats and sun cream for yourselves - I was at the zoo yesterday and it was pretty hot. 3. Gayle has kindly arranged the wrist bands for the kids so that we can assign the groups specific colours. We therefore no longer need you to bring ribbons / bandanas as discussed on Monday. 4. 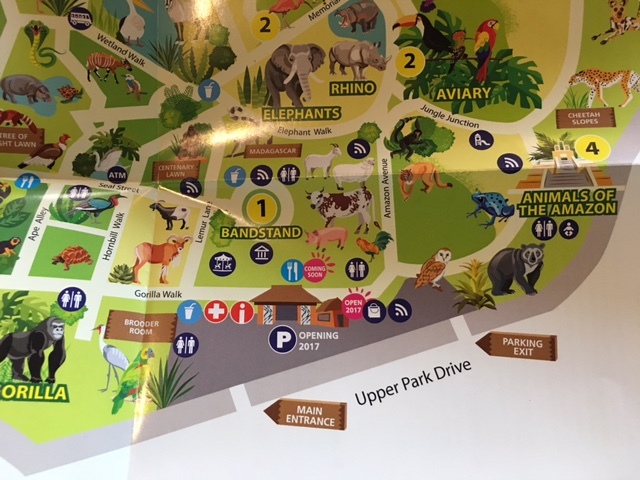 If you are a bit late on the day and we've already gone in, you can make your way to the bandstand - Area 1 on the internal map of the zoo. I will be there for most of the morning setting up the food and this will be the central "go to" / meeting point if there are any problems. Thank you to the following people and companies who have contributed to the zoo trip and have saved Edu Fun hundreds of Rands. TYRONE Fruiterers, Parkview - 180 oranges. Gillean, Ogechi, Sachi and Chantal for making the peanut butter and jam sandwiches. All the volunteers who will be joining us. MONDAY 18 SEPTEMBER 2017 - Fancy Dress theme to coincide with Heritage Day celebrations. Volunteers who come on Mondays are asked to wear something that is synonymous with their heritage. Even if it's just a hat or holding your country's flag. We are hoping that the teachers will also wear something traditional on the day as well. It would also be great if each of you could say something about your heritage / nationality / country to the children in the class that you are in that day. SCHOOL CLOSES ON FRIDAY 29 September 2017. There will not be a lesson on Monday 2 October and Tuesday 3 October. Lessons will resume on Monday 9 and Tuesday 10 October. September 8 was declared International Literacy Day by UNESCO on November 17, 1965. Its aim is to highlight the importance of literacy to individuals, communities and societies. THANK YOU TO ALL OUR EDU FUN VOLUNTEERS WHO CONTINUE TO "WRITE THE FUTURE" FOR OUR KIDS IN DIEPSLOOT! I hope you all get a chance to celebrate Literacy Day in some way - reading a book with/to your own children, or that you find a few minutes to read your own book. Click here to read more about this year's International Literacy Day. The theme this year is "Literacy in a digital world"
Please let me know if you have any questions or suggestions. If you would prefer not to receive this weekly newsletter, please ask us to put your details on the "General News" list or "unsubscribe" below.